Jaromir Jagr and the Pittsburgh Penguins have an interesting relationship. Always have, really. The fifth overall pick in the 1990 NHL Draft spoke almost no English, and struggled through his first month with the club. The Penguins promptly traded for Czech-speaking veteran Jiri Hrdina, Jagr found production as his comfort level rose, and the rest was history. His combination of size and skill were rivaled only by his longtime teammate, Mario Lemieux. From 1990 to 2001, the superstar out of Kladno, Czech Republic earned five Art Ross Trophies, two Lester B. Pearson Trophies (Ted Lindsay Award) and the Hart Memorial Trophy. Jagr also helped the Penguins capture the first two Stanley Cup championships in team history in 1991 and 1992. During both runs, he stood head-and-shoulders above the opposition. As a member of the Penguins, “Mario Jr.” never missed the playoffs, served as team captain from 1998 until 2001, sported the best mullet in hockey, and was arguably the most beloved player to grace the Civic Arena ice. That all changed in 2000 with a simple request. Well, more of a demand, really…two of them. 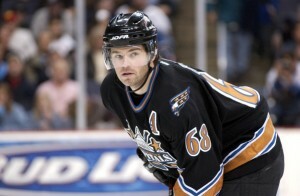 Prior to the 2000-01 season, Jagr demanded a trade from Pittsburgh to get a “fresh start” in a new city. Ownership refused to grant the request, as a contract was in place to keep him in a Penguins’ sweater until 2003. Then, with the Penguins toeing the line between contender and pretender as a near-.500 team, a slumping Jagr again demanded a trade. Lemieux had a better solution in mind. As depicted in Robert Cohen’s book, “50 Most Dynamic Duos in Sports History,” Lemieux and Jagr dominated as a tandem for parts of six seasons up to that point. It was in 68’s best interest to give it another go with 66. He rescinded his trade demand, and finished the year with a Penguins team that made an Eastern Conference-final run; though, it wasn’t without its interesting moments. Jaromir Jagr traded to Capitals for three prospects after 11 seasons with the Pittsburgh Penguins. Most everyone in Pittsburgh, if not the entire NHL, knew that the future hall-of-fame right winger would be traded after the season. On July 11, the rumors became reality as Jagr was traded to the Washington Capitals for Kris Beech, Michal Sivek, and Ross Lupaschuk. General Manager Craig Patrick noted that Beech had the tools to become a franchise player, which was a gross oversight on his part. The Penguins did not make a post-season appearance again until 2007 after eleven consecutive years of qualifying. The Capitals did not fair much better, as the team earned a tournament spot only once – a first-round exit in six games against Tampa Bay- with Jagr donning a red, white and blue jersey. Since leaving Pittsburgh, the ageless wonder has continued to play at a high level. He earned another Pearson Trophy in 2006 as a member of the New York Rangers, with whom he played three seasons before heading to Russia for a 3-year KHL stint. After announcing that he planned to return to the NHL in 2011, #JagrWatch began in Pittsburgh. Several media reports indicated that the now fourth-best scorer in NHL history would return to the Penguins to play alongside Evgeni Malkin. It seemed that the city and Jagr mended fences, and that a Stanley Cup run was inevitable with the possibility of Sidney Crosby’s return to the ice after a long hiatus caused by post-concussion syndrome. Jaromir Jagr breaks the hearts of Penguins fans after signing with Philadelphia in 2011. Jagr signed a 1-year $3.3 million contract with the Penguins’ most-hated rival, and sent a Liberty Bell-sized dagger through the collective hearts of the entire Pittsburgh fan base. Penguins faithful felt cheated, abused and robbed. For them, it was personal. For Jagr, simply put, the Flyers offered him over $1 million more in salary. No harm in cashing in, right? Philadelphia not only signed Jagr; it utilized his talents to oust the Stanley-Cup favorite Penguins in a wild six-game first-round series that year. Then, one year later, Jagr joined the Boston Bruins. Again, he and his squad eliminated a powerhouse Penguins team, this time in the Eastern Conference Final. Three teams later – Dallas, New Jersey and Florida – and Jagr is still trucking along at 43-years-old. No matter how hurt Penguins fans are with his choices (and the boos continue to rain on him at Consol Energy Center), they’d still welcome him back into the black-and-gold with open arms. In fact, #JagrWatch returned briefly in 2015. Though it ended in similar fashion, people in Pittsburgh refuse to give up hope for coming seasons. Jagr to Florida? Interesting. The Panthers are pretty good. 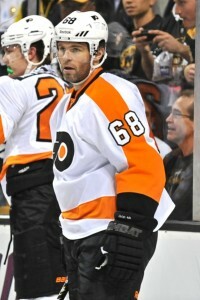 But this isn’t the end of #jagrwatch He’ll play a couple of more years. As his career comes closer to the end, one thing seems certain, at least to this writer: the only way Jagr returns to Pittsburgh as a Penguin is to have his jersey raised up beside Lemieux’s in the CEC rafters. And yes, his time in the city warrants a post-career celebration, if and when he actually does retire. As for a return prior to that, don’t hold your breath. The Penguins simply cannot afford to pay Jagr what other teams will offer. He still possesses incredible skill and a brilliant hockey mind, two attributes that – had he not gone to Russia for three years – would put him in the 2,000-point club with only Wayne Gretzky. Don’t be sad, Penguins fans. Eleven years, 806 games, 1079 points and two titles far surpass any late-career reunion. Case-in-point: Alex Kovalev, who will be remembered more for 1998-03 than for his forgettable return to Pittsburgh in 2011. So, don’t waste time booing and jeering. Spend it enjoying history-in-the-making. Jaromir Jagr is a generational superstar who adapted to every sort of NHL style thrown his way. Many fans and media-types continue to place emphasis on an ever-changing brand of professional hockey, and they’re right to do so. Jagr never seemed to notice any changes, as he played the same way throughout his career, never phased by increased physicality or clutching and grabbing. Honestly, not many players have been able to get a clean hold on him. So, before depression from the next #JagrWatch sinks in , take the time to watch him play, even if it is for another team. As a Penguins player, Jagr was a supernova on skates. If you’re looking for nostalgia, take to YouTube. There are plenty of great moments to go around.